It’s fair to say that there has been plenty of hype over Free From Frizz – how many hair treatments are so great that they have a whole Daily Mail article shouting about how amazing they are! So when I was invited to try out the range, I couldn’t refuse! I wouldn’t describe my hair as hugely frizzy, but rather it is dry at the ends, and ‘fluffy’ – not a good look! The product is a breakthrough in anti-frizz technology, promising frizz free hair for up to 6 weeks as well as leaving hair soft, shiny and manageable. My hair is thick so I chose the Mango range, but if you have fine hair then the Watermelon set is the one for you. 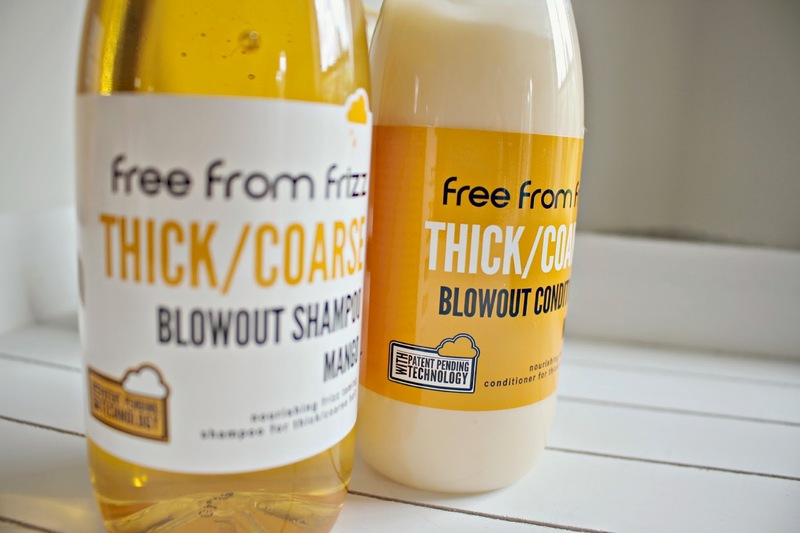 I love the packaging for the kit – how adorable is the milk-carton inspired box, and little old-fashioned milk bottle shaped shampoo and conditioner! The full Blowout kit contains a shampoo and conditioner, which can be used on their own without the kit, and they work to minimise frizz – but are more effective if you have used the blowout kit beforehand. Similar to a salon Keratin treatment – the Free From Frizz 6 Week Blowout works with a combination of reactive ingredients which work to protect, restructure, and condition the individual hair shafts. With results of up to 6 weeks of frizz-free hair regardless of the weather, the treatment saves you tons of time in the morning and gives your hair a break from using so many styling products which can weigh the hair down. The kit contains a bottle of pre-cleanser, the active Keratin treatment, and a Denman Black Be-Bow massage brush as well as a pair of plastic gloves. It is worth setting aside a couple of hours of pampering to do the whole treatment. Firstly, wash hair using warm water, cleansing with the Pre-Cleanse shampoo twice, and combing through with the brush provided, then rise without conditioning. Then towel dry hair or blow dry leaving slightly damp. I found this quite hard without using conditioner – did I mention that my hairs natural form is a clumpy matted mess?! Divide hair into sections and then apply the Active Keratin Treatment using the nozzle applicator, then brush downwards using the brush provided for full and even coverage. Be careful not to oversaturate hair. Leave the treatment to absorb for 30-40 mins – the perfect time to re do your nails and apply a face mask! After rinsing hair with warm water, towel dry of blow dry and leave slightly damp. Then, after sectioning hair again, straighten each section, going over each section 6 or 7 times. Be sure not to miss any! It’s important not to tie up your hair, or wash for up to 48 hours before you do the treatment, to allow it to set. Also – make sure you do a patch test before using the treatment. So.. the results! Overall I loved the easy of the treatment – yes it would be nice to sit in a Salon and have someone else do all the handwork, but for someone who doesn’t suffer hugely from frizz, it seems crazy to spend that sort of money! I found it quite hard to keep my hair down for 48 hours – I am always pulling my hair into a pony tail or bun at work and when I go to bed, and wasn’t loving how greasy my hair got after 48 hours – if I were to do this again, I wouldn’t do it during a heatwave!! Plus, my hair smelt very odd during the first 48 hours and so I was just dying to wash it, but I left it to fix. I really noticed the difference the first time I blow dried my hair afterwards – usually i’ll spend 20 minutes working through it with my Tresseme paddle brush, but this time the brush just glided through my hair with so little effort – unbelievable! No clumps! My hair blow dried with no kinks, flyways massively reduced and super silk soft. I’ve been getting compliments from friends and colleagues about how shiny my hair is – and this NEVER happens! I applied the kit just last week so I can’t comment yet on whether the 6 week claim is true – but I will keep you updated! But first impressions are definitely positive – it’s fantastic that a kit costing less than £20 delivers such noticeable results. 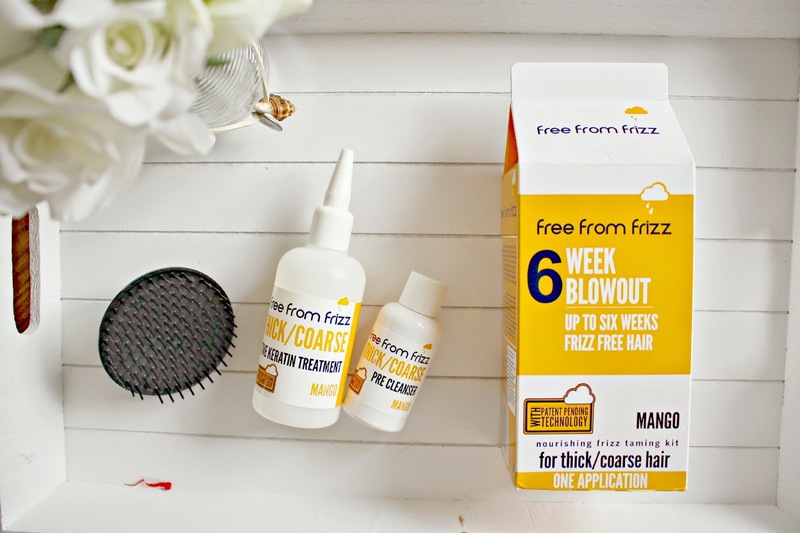 The complete kit is £26.97 directly from the Free From Frizz website, and you can get an exclusive 20% off with the code #frizzfreesummer. The set also includes the shampoo and conditioner which I would repurchase even if I hadn’t used the treatment. I would recommend this kit to anyone who suffers from frizz – even if not a major concerns, just because the results are just so spectaular! If you are considering getting a salon treatment then there’s nothing to lose by trying this kit out first – next time i’ll definitely be doing this on a cool weekend though – trust me, your hair isn’t pretty for those 48 hours, but the final results are so worth it! 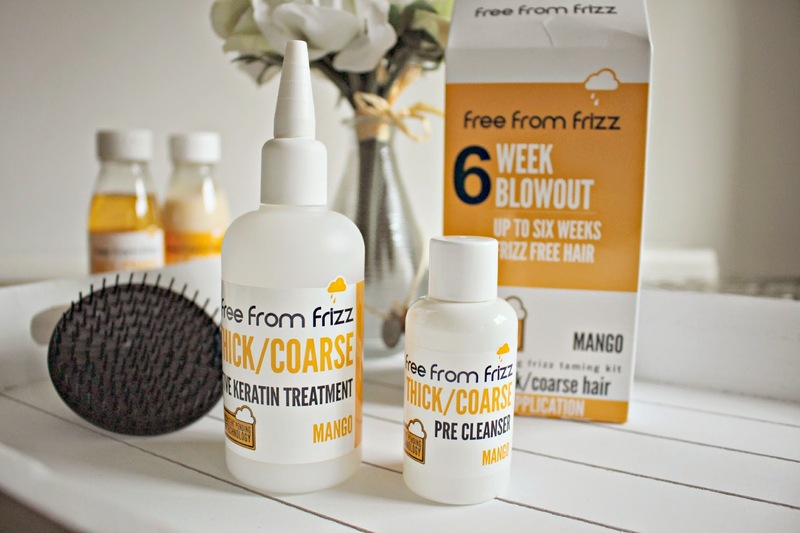 Have you ever tried a frizz-reducing treatment?